2nd generation Nuke Performance 3.0 liter Fuel Surge Tank is market leading with top quality combined with outstanding performance. This new version is the first of its kind specially developed and designed to mount a single or dual setup of Walbro GST 450 fuel pump. Combine the two internal fuel pumps into one 7/8 AN-10 outlet. This Fuel Surge Tank is able to deliver steady fuel flow even over 1400hp. Run one or two fuel pumps individual with multi electrical connectors on the top lid. Designed and manufactured to handle extreme amounts of power with the same hallmark as all of Nuke Performance products. Everything is included for running single or dual fuel pumps. Fuel pumps are mounted with the billet internal mounting bracket. This Fuel Surge Tank comes with and internal bracket for 39mm fuel pumps, making it possible to run any 39mm fuel pumps such as DW200, DW300, AEM 340L etc. There is also a FST with a internal bracket for the DW400. With our Fuel Surge Tank, you minimize the risk when running at low fuel level, that the system not cope with the extremely hard driving such as drifting, drag racing and track days where you can exceed 2g, which could result in fuel loss. The Fuel Surge Tank works as a buffer so the fuel pumps are always supplied with fuel for high outputs. 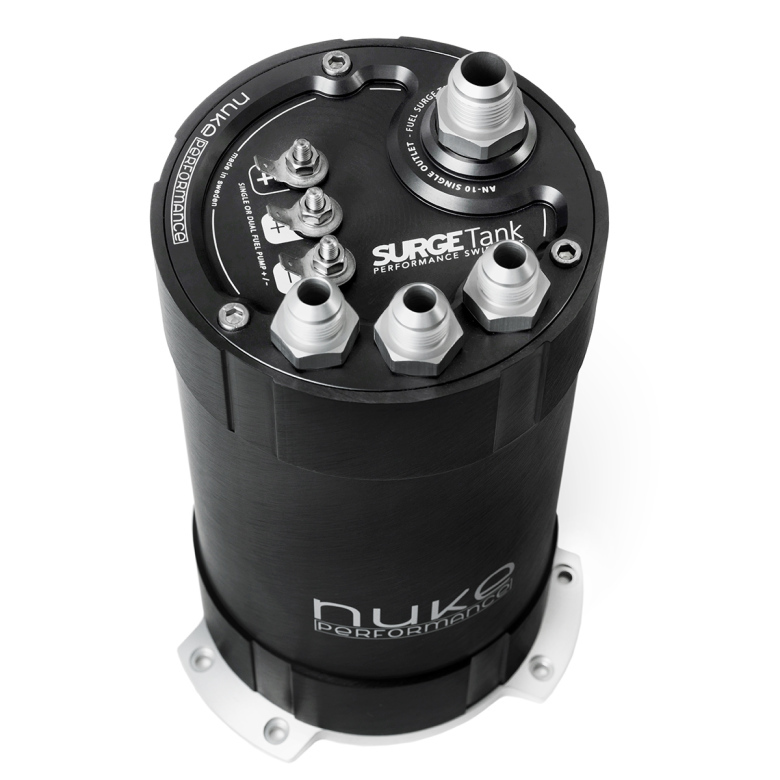 Our Fuel Surge Tank is available in several different setups, each one designed to perform to the maximum, either with internal fuel pumps or external fuel pumps. Comes with a billet mounting bracket with our six bolt pattern making it sit stable in any installation. Delivered with billet aluminum mounting bracket for easy mounting And 3 x 3/4 AN-8 fittings and 1 x 7/8 AN-10 for the top cover connections. 3/4 AN6 - AN10. and 7/8 AN-12 is optional and are sold separately. • CNC manufactured from aluminium alloy 6063. • Stainless steel bolts for long lasting function and appearance. • Holds a volume of approximately 3 liters. • Delivered with 3 x 3/4 AN-8 and 1 x 7/8 AN-10 fittings. • 7/8 UNF Port, available to AN-10, AN-12 line. • Billet aluminium mounting bracket with 6x mounting holes. * All measurements excluding the supplied fittings.